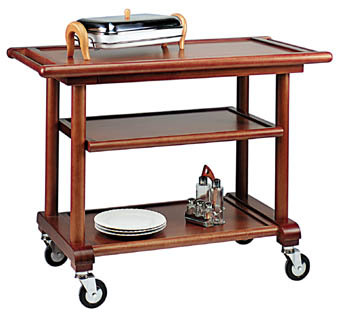 The Massello Collection: a line of quality trolleys to enhance presentation. Manufactured in selected hardwoods and veneered wood with a walnut finish or a rosewood stain, these elegant front of house trolleys complement both modern and classic design environments, adding style and a touch of flair to upmarket establishments. 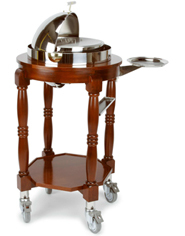 The extensive MPD collections include a wide variety of models and stylish accessories to suit: liqueur and wine trolleys, Gueridon, domed and marble top cheese and sweet trolleys, luggage and bellman's carts, as well as elegant flambé trolleys for the finest presentation when cooking at the table. Ref. 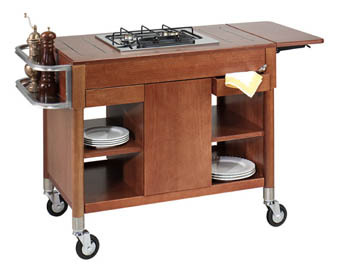 6404 - Single burner Flambé trolley. recessed drawers, side condiment shelf, concealed gas bottle compartment, folding plate support, swivel castors. Ref. 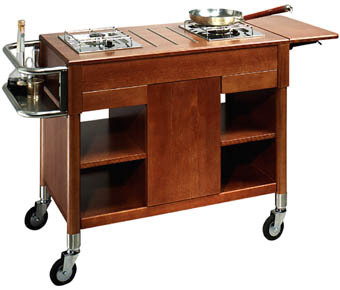 6400 - Double burner Flambé trolley. recessed drawers, side condiment shelf, concealed gas bottle compartment, folding plate support, swivel castors. Ref. 6402 - Twin burners Flambé trolley. recessed drawers, side condiment shelf, concealed gas bottle compartment, folding plate support, swivel castors. Ref. 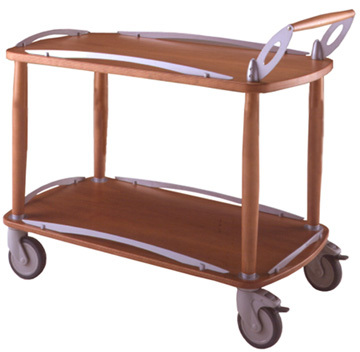 1460 - Mini Carver - Stunning Carving trolley, manufactured in selected hardwoods. Chrome dome, spiked cutting board, knife rest and plate holder. A top of the range, high quality presentation item. Ref. 1461 - Large Carver - Stunning Carving trolley, manufactured in selected hardwoods. Chrome dome, spiked cutting board, knife rest and plate holder. A top of the range, high quality presentation item. Ref. 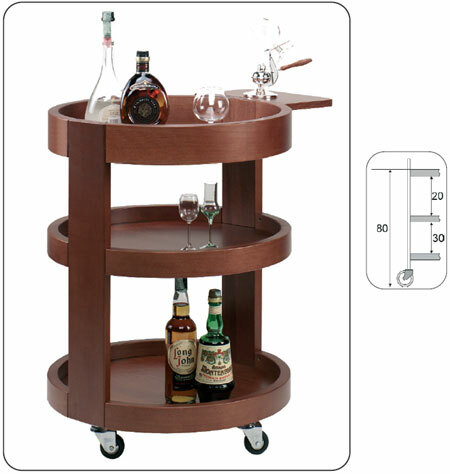 6310 - Circular Liqueur trolley, manufactured in selected hardwoods. Unique stylish design. Beechwood frame and shelves. Enhance your table service presentation. Ref. 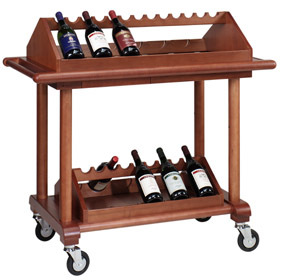 6320 - Wine Display trolley, beechwood frame and shelves. Removable bottle holders. Sliding plate support. Swivel castors. Ref. 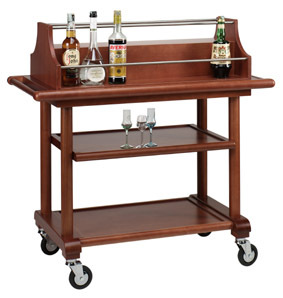 6300 - Liqueur Display trolley, beechwood frame and shelves. Removable bottle holder. Sliding plate support. Swivel castors. Ref. 6000 - Gueridon trolley, beechwood frame and shelves. Walnut finish. Swivel castors. Understated and elegant. Also available in wengé finish in our Palissandro Collection. Ref. 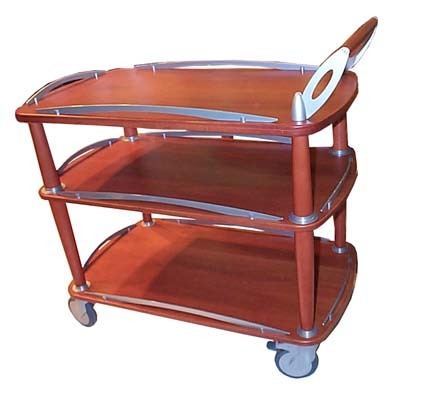 6102 - Elegant service trolley, wood frame and shelves. Walnut stain. Swivel castors. Ref. 6100A - Domed top with wooden base for 6100/6102. Perspex dome opens both sides. Ref. 6100C - Liqueur display top for 6100/6102. Ref. 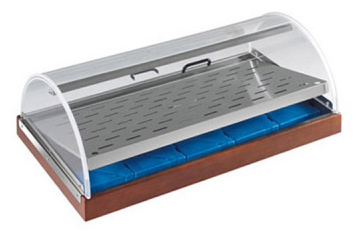 6100H - Domed top with stainless steel grille to display hors d'oeuvres, cheese or desserts for 6100/6102. Perspex dome opens both sides. Shown with optional set of chilled plates ref. 6100G. Ref. 6100E - Wine display rack for 6100/6102. Fits top of trolley. Ref. 6100F - Wine display rack for 6100/6102. Fits bottom shelf of trolley. Ref. 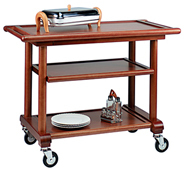 6052 - Beechwood and composite designer Service trolley with lacquered metal details. Cherry wood stain. Three tier. Also available in wengé finish. Ref. 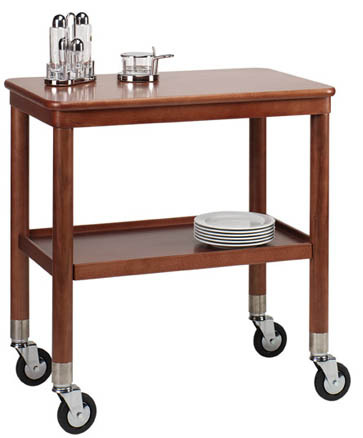 6050 - Beechwood and composite designer Service trolley with lacquered metal details. Cherry wood stain. Two tier. Also available in wengé finish.